The magic never fails and once again on the busiest day of the year at Sainsbury’s, Moor Allerton, children and adults alike flocked to see the real Santa, the one with the real whiskers. 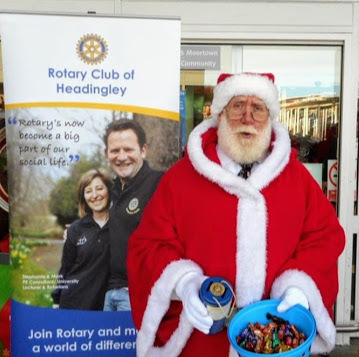 The truth of the matter is that five different Santas and 22 volunteers from Headingley Rotary Club collected during the day to raise the impressive sum of £2,255.30 for local charities. The rain held off and the Christmas spirit lasted the entire eight hours that we collected. This year’s recipients are: St Gemma’s Hospice, Sue Ryder Wheatfields Hospice, Caring For Life, St George’s Crypt and Leeds South & East Foodbanks. Special thanks to Steve Bates, Liz and our treasurer, Alan Wittrick who made sure that Santa did not run off with the cash!.